Sure thing BB. Locally we call it "Toppers" by one particular brand name. Quite famous here. But we have a better option now. A husband and wife team started making veggie protein assemblies a few years ago, has a little soy in it, and we buy all the varieties. Delicious and as veggieterianos we are quite grateful to them for their product offering which is growing year by year. Called Fry's!! 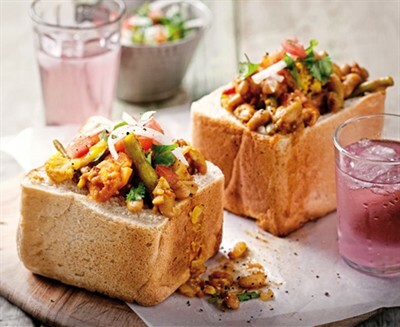 Here is a quite famous South African food that is eaten by those down on money, but also by enthusiasts that love the style of it!! 1) Fry the onions, garlic and ginger until softened and golden, add the curry powder and combine. 2) Add the tomato paste, whole peeled tomatoes and fresh tomatoes. 3) Add 1 cup of water and season. 4) Allow the mixture to simmer and the fresh tomatoes to soften. The sauce should have reduced to a runny porridge consistency, check the seasoning and add sugar to remove the tartness of the tomato. 5) Fry the Chicken-style or Chunky Strips in a little oil for 6-8 minutes and add to the sauce. 6) Prepare the bread by hollowing out the middle and fill it with the curry. Garnish with chopped coriander. 7) Serve with condiments of your choice. my 1000th post on GT!! Cut the onions in medium-sized strips and fry them in some sunflower oil until caramelised. Set the onions aside, and in the same oil fry up Fry’s Vegetarian Beef-Style Strips for about 10 mins. Add the onions again, and pour in a small glass of red wine. Let it simmer for about a minute, then pour in the vegetable stock. Add the cut carrots and swede (peas and other veg are optional, too). Sprinkle with rosemary, thyme and sage, then cover the stew with the sliced potatoes. Cover with kitchen foil and put in the oven at 200 degrees for about 30 mins. Remove kitchen foil and bake for another few mins at 250 degrees until the potatoes are browned. When I was young and we lived in Oklahoma, my Mama made this for us for breakfast during the winter. It is a wonderful, filling, creamy concoction for a cold day. She added sugar and raisins before serving. There was always a small cream pitcher on the table, too. East Texas HATES this recipe 1) it uses instant or minute rice ("not real rice") and 2) it is sweet. Redbone from North Louisiana - only eats his rice with gravy! Mix in pan; bring to boil. Stir constantly over medium heat until creamy. Serve with sugar and milk. Makes 5 servings.